Note: Please Pay Attention to the Tire Location on Duals. 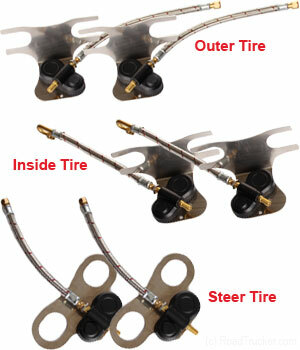 The Hoses for the Inner Tires are Oriented Differently, than the Hoses for the Outer Tires. Note: Use SCE Sensors on the Steer Tires. TST HUB sensors are Flow-Through sensors that allow air to be added or removed without removing the sensor. Use the monitor to top off the air when it indicates that the tire air pressure is getting low.